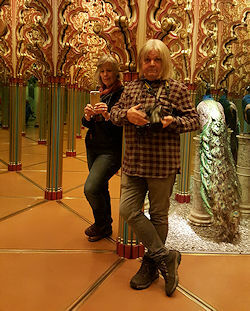 Labyrinthos was founded in 2000 by Jeff & Kimberly Saward to provide an information resource and photo library for those working with labyrinths and mazes. Whether your idea of a labyrinth adventure is inward into the depths of your own being, or out to the edges of civilization and history in search of far-flung labyrinths, we welcome you to the path. We travel the world in search of labyrinths old and new, offering lectures, workshops, and tours, researching and photographing as we go. Along the way we meet fascinating people in interesting places, and are turning to this blog as a way of staying in contact with our labyrinth friends and colleagues. We hope you’ll join us on our adventures.